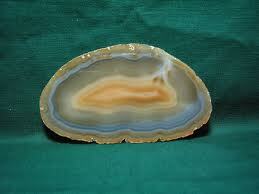 Brazilian agate is a variety of chalcedony and comprised of cryptocrystalline quartz. It has a hardness of 6.5 to 7.5 on the Mohs scale. It occurs in bands of varying color and transparency. The Brazilian varieties are characterized by peculiarities in the shape and color of the bands, which can be seen in sections when cut at right angles to the layers. The banding in Brazilian agates forms as silica from ground water is slowly deposited into cavities and veins in the older rock. 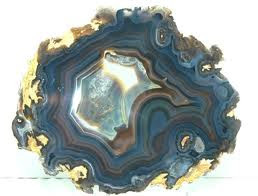 Agate is found throughout the world as nodules in volcanic or other eruptive rock and also in hollow geode form. 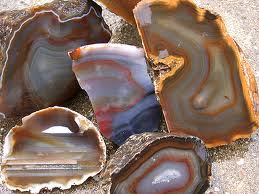 Brazil is a major producer of agates. 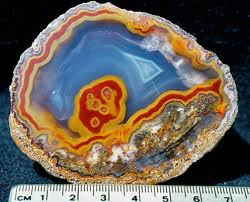 Agates are identical in chemical structure to jasper, flint, chert, petrified wood, and tiger's-eye, and are often found in association with opal. The colorful, banded rocks are used as a semiprecious gemstone. Brazilian agates can be artificially stained to produce a combination of colors more vivid than those found in the natural state. 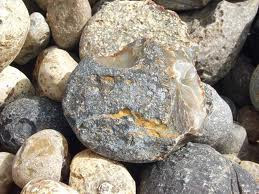 The agates from Brazil are mostly mined from decomposed volcanic ash and basalt from the late Permian age (248-275 million years ago) In Rio Grande do Sul the "agate mines" are normally just plowed fields in which loose agates are found and collected. 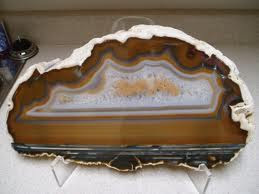 Brazilian agates are very colorful stones with some of the most beautiful inclusion and structures imaginable. Agate is very hard and takes an excellent polish. Sadly, most of the market for Brazilian agates is for the dyed versions of these stones. When you see a pink,teal, purple or green agate it is dyed and not natural. Support the Rock Chippers and attend their show this Month! 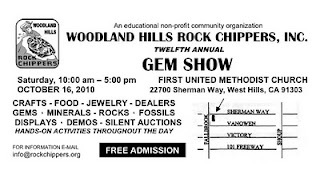 Please support the Rock Chippers and attend their show. !! FREE ADMISSION!! !! FREE ADMISSION!! !! FREE ADMISSION! !